← The PrimaLuna ProLogue 8/Classic CD Player: The Absolute Sound Editors’ Choice Award 2015! The PrimaLuna ProLogue Premium Integrated amplifier! The Absolute Sound Editors’ Choice Award 2015! Adaptive AutoBias. A PrimaLuna exclusive. If anybody tells you that they have auto bias, ask them precisely how. It’s most likely not true. As with all PrimaLuna amps, you never have to worry about biasing your amp ever again, and the need for matched tubes is eliminated. Just plug in EL34, KT88, or KT120 (as well as many others) and AAB does the rest while improving sound quality. Tubes are constantly monitored and kept in their best operating range, reducing distortion by up to 50%! Home theater pass-thru. Straight from the critically-acclaimed DiaLogue Series, this direct-line circuitry means less noise and coloration over unity gain circuits. You can hook it up to a surround processor, and when you switch the ProLogue Premium to HT the amplifier becomes in essence a power amp. Relay based input selection. Instead of a cheap selector switch, PrimaLuna has a relay and circuit mounted at every input. If you select a CD player input, for example, a relay closes and a perfect load is presented to the item you are listening to. All other relays are open so as to prevent crosstalk between inputs. This is many times more expensive to build, and you would never see it, but it is what PrimaLuna stands for! SmartWatts design. PrimaLuna’s true-value, low stress design philosophy. Many manufacturers fudge on their power ratings, claiming power that is mathematically impossible. 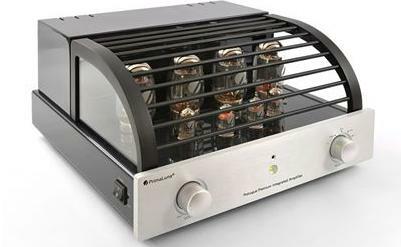 Every seasoned tube owners knows that 20 watts from a tube amp is a ton of power. What is really important is that PrimaLuna runs their power tubes up to 40% easier that other manufacturers. You can tell easily by putting your hand on top of a PrimaLuna amp. They run cooler than others. There is no reason to run tubes at their jagged edge. Why do manufactures do it? Click here to see more. BTI-circuit. BTI stands for “Bad Tube Indicator.” On the chassis’ deck in front of each power tube, is a small LED that lights up if the tube goes bad. The circuit then puts the amp into protection mode. With other brands, this may be when you have to break out the soldering iron to replace a plate resistor, and replace two or four tubes because your amp requires matched sets. With PrimaLuna, you just replace the tube it tells you to (no matched tubes required), and turn the amp back on. No hassles, no headaches. PTP-circuit. If the power transformer should overheat, this “Power Transformer Protection” circuit cuts primary power, allows the amp to cool down, then resets itself. OTP-circuit. The “Output Transformer Protection” circuit protects the output transformers in the event of a massive tube failure or user error. The ProLogue Premium Integrated Amplifier has also received “The Absolute Sound Editors’ Choice Award 2014″ For more information about The PrimaLuna ProLogue Premium Integrated Amplifier check www.primaluna.nl and www.primaluna-usa.com. If there is NO dealer or distributor nearby? Please contact us DIRECT! Dit bericht werd geplaatst in Algemeen info - Informations générales, Awards - Oscars, Dealers - Revendeurs, PrimaLuna, Versterkers - Amplificateurs en getagged met The Absolute Sound Editors' Choice Award 2015 PrimaLuna ProLogue Premium Integrated Amplifier. Maak dit favoriet permalink.